B2B networking awards. My Pinnacle Network recognizes region’s best connectors with Networking Ninja Award winners. – My Pinnacle Network y Pinnacle Network, the B2B networking group with monthly meetings in Braintree, Mansfield, Marshfield, Needham, Plymouth and Westborough, MA, recently announced the winners of its fourth annual Networking Ninja Awards. The newly minted Networking Ninja Awards were created to recognize the region’s best networkers in four separate categories: Best Connector (helping bring people together); Most Ubiquitous (appears to be at every networking event); Most Altruistic (does most for others); and Brightest Beacon (adds energy to networking events). Carmella Beroth, of Debt Management, Inc. in Mansfield, MA, took home the honors as Best Connector. She is a member of My Pinnacle Network-Mansfield. Sheldon Prenovitz of Concord, MA-based ConnectPay won the Most Ubiquitous Networking Ninja Award. He is a member of My Pinnacle Network-Westborough. Brian MacFee of System Support in Marshfield, MA won the Brightest Beacon honors. He is a member of My Pinnacle Network-Braintree Third Thursday and My Pinnacle Network-Marshfield. Lois Drukman of Walter May Insurance in Hingham, MA won the Most Altruistic Networking Ninja Award. She is a member of My Pinnacle Network-Marshfield and My Pinnacle Network-Plymouth. She is also one of the owners of South Shore Networking Professionals, which hosted the awards ceremony at its regular third Tuesday event at the Cask & Flagon Restaurant in Marshfield, MA. An additional award was given this year to My Pinnacle Network Partner Joe D’Eramo. My Pinnacle Network Founder Steve Dubin awarded the “Unsung Hero” trophy for his behind-the-scenes work. He also noted his work writing and publishing My Pinnacle Network’s book, 15 Keep-it-Simple Tips for B2B Networkers, available at www.mypinnaclenetwork.com. “Congratulations to all the winners. We had a number of networkers nominated for these awards and these individuals stood out as the cream of the crop in our region,” said Steve Dubin, founder of My Pinnacle Network. “Each of these winners has proven themselves to be first-rate connectors who are givers first, which is how they ultimately receive referrals for their respective businesses.” Voting for the Networking Ninja Awards took place from January 1 through February 28 on the My Pinnacle Network website, www.mypinnaclenetwork.com. Other members of the B2B networking organization nominated for awards include: David DeBlasio of Deblasio Marketing located in Dedham, MA and My Pinnacle Network-Mansfield; Calvin Nelson of CCNIII of Stoughton, MA; Alex Bungener of Digital+ in Cotuit, MA and My Pinnacle Network-Marshfield; Jim Hickox of Apple Corps Cleaning in Weymouth, MA and My Pinnacle Network-Braintree Third Thursday; Jay Nuss of Jay Nuss Realty of Braintree, MA and My Pinnacle Network-Braintree Third Thursday; Richard Archibald of Aflac and My Pinnacle Network-Marshfield; Dave Gilman of Cognito Creative and My Pinnacle Network-Westborough; and David Allen of Balance Wealth Advisors in Wellesley, MA and My Pinnacle Network-Needham/Newton and My Pinnacle Network-Westborough. “Networking, sharing information and opportunity, is what makes the world go round,” noted Dubin. “Both whimsical and pragmatic, the Networking Ninja Awards provide recognition for many who typically do great deeds and humbly hang in the shadows.” For information about My Pinnacle Network's B2B networking groups, please visit www.MyPinnacleNetwork.com, or contact Steven V. Dubin at SDubin@MyPinnacleNetwork.com or 781-582-1061. B2B networking awards. My Pinnacle Network recognizes region’s best connectors with Networking Ninja Award winners. My Pinnacle Network, the B2B networking group with monthly meetings in Braintree, Mansfield, Marshfield, Needham, Plymouth and Westborough, MA, recently announced the winners of its fourth annual Networking Ninja Awards. The newly minted Networking Ninja Awards were created to recognize the region’s best networkers in four separate categories: Best Connector (helping bring people together); Most Ubiquitous (appears to be at every networking event); Most Altruistic (does most for others); and Brightest Beacon (adds energy to networking events). Carmella Beroth, of Debt Management, Inc. in Mansfield, MA, took home the honors as Best Connector. She is a member of My Pinnacle Network-Mansfield. Sheldon Prenovitz of Concord, MA-based ConnectPay won the Most Ubiquitous Networking Ninja Award. He is a member of My Pinnacle Network-Westborough. Brian MacFee of System Support in Marshfield, MA won the Brightest Beacon honors. He is a member of My Pinnacle Network-Braintree Third Thursday and My Pinnacle Network-Marshfield. Lois Drukman of Walter May Insurance in Hingham, MA won the Most Altruistic Networking Ninja Award. She is a member of My Pinnacle Network-Marshfield and My Pinnacle Network-Plymouth. 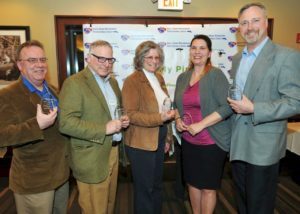 She is also one of the owners of South Shore Networking Professionals, which hosted the awards ceremony at its regular third Tuesday event at the Cask & Flagon Restaurant in Marshfield, MA. An additional award was given this year to My Pinnacle Network Partner Joe D’Eramo. My Pinnacle Network Founder Steve Dubin awarded the “Unsung Hero” trophy for his behind-the-scenes work. He also noted his work writing and publishing My Pinnacle Network’s book, 15 Keep-it-Simple Tips for B2B Networkers, available at www.mypinnaclenetwork.com. Voting for the Networking Ninja Awards took place from January 1 through February 28 on the My Pinnacle Network website, www.mypinnaclenetwork.com. Other members of the B2B networking organization nominated for awards include: David DeBlasio of Deblasio Marketing located in Dedham, MA and My Pinnacle Network-Mansfield; Calvin Nelson of CCNIII of Stoughton, MA; Alex Bungener of Digital+ in Cotuit, MA and My Pinnacle Network-Marshfield; Jim Hickox of Apple Corps Cleaning in Weymouth, MA and My Pinnacle Network-Braintree Third Thursday; Jay Nuss of Jay Nuss Realty of Braintree, MA and My Pinnacle Network-Braintree Third Thursday; Richard Archibald of Aflac and My Pinnacle Network-Marshfield; Dave Gilman of Cognito Creative and My Pinnacle Network-Westborough; and David Allen of Balance Wealth Advisors in Wellesley, MA and My Pinnacle Network-Needham/Newton and My Pinnacle Network-Westborough. For information about My Pinnacle Network’s B2B networking groups, please visit www.MyPinnacleNetwork.com, or contact Steven V. Dubin at SDubin@MyPinnacleNetwork.com or 781-582-1061.